Four out of five African families depend on agriculture for their livelihoods, yet just four percent use irrigation with the rest relying on increasingly unreliable rainfall. We know that switching to irrigated agriculture can increase yields by up to 90 percent when compared to nearby rain-fed farms – however high diesel costs make irrigation an unaffordable expense for most small farmers. With 620 million Africans lacking a connection to the electricity grid, electric water pumps are also not a viable option. This October, with support from Shell Foundation (the independent UK charity), the UK Department for International Development, (DFID) and the GSMA, we launched a new product, RainMaker, which is the lowest cost solar pump available in Africa today. Here are four lessons that we learned from our first cohort of customers. 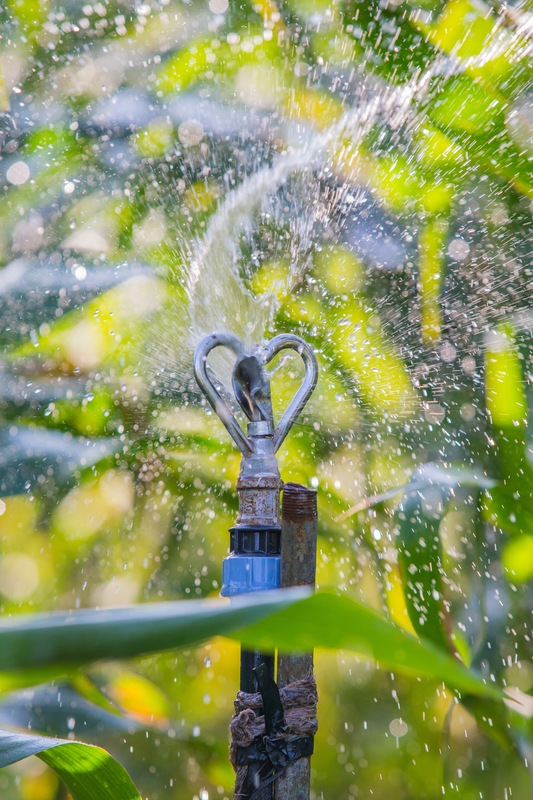 Most people associate irrigation with growing high-value fresh fruits and vegetables. When we started the business, we did, too. The reason that irrigation is commonly used to high value crops is because the economics made sense. Even if a farmer wanted to purchase an AgroSolar Irrigation Kit from us in early 2017, their all-in cost was at least $3,690. In order to recover that payment within a year, a farmer would have to grow high value crops. 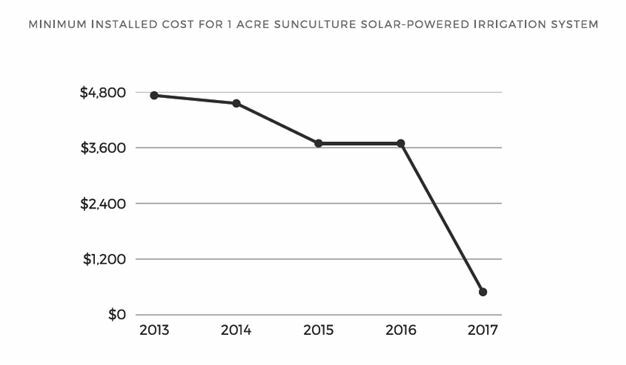 Farmers who purchased our AgroSolar Irrigation Kit were making an average of $14,000/acre/year, so this made sense. But for a farmer growing maze who makes approximately $600/acre/year, buying the AgroSolar Irrigation Kit didn’t make sense. The introduction of the RainMaker changed this. For a $100 deposit and between $45-65/month, a farmer can now purchase a RainMaker. SunCulture customers using a RainMaker to irrigate maize report doubling yields, meaning an additional $600/acre/year, and also meaning that irrigation became affordable for them. This is really exciting as maize farmers are some of the most vulnerable and poorest farmers and this product was working for them without the additional risk associated with pivoting from a low value crop to a high value crop. Maize farmers can continue to farm the crop they know how to farm, and double their yield. Lesson 2 – Show Me The PERFORMANCE. That being said, price is not the first factor customers assessed. Performance is. Most SunCulture customers get their water from an existing water source, such as a borehole, and unless the new pump works with that water source, it is not useful to them Research from the British Geological Survey and University College London indicates that Africa possesses 660,000 cubic kilometers of groundwater, more than 100 times the continent’s annual surface water. In Kenya, 2.1 million households access water from wells and boreholes compared to 0.25 million using streams and rivers. Average pumping head in Kenya is 30 meters, this means that a pump needs to lift water 30 meters from the water source up to a field or tank. However, most available low-cost solar water pumps are limited to 10-15 meters of head. This means that these pumps are not useful to the majority of households whose water source is deeper. We realized that whilst cost is important, performance is equally important and hence designed a pump that can reach up to 100 meters of depth. This is why performance and relevance is the first metric we use when creating products. 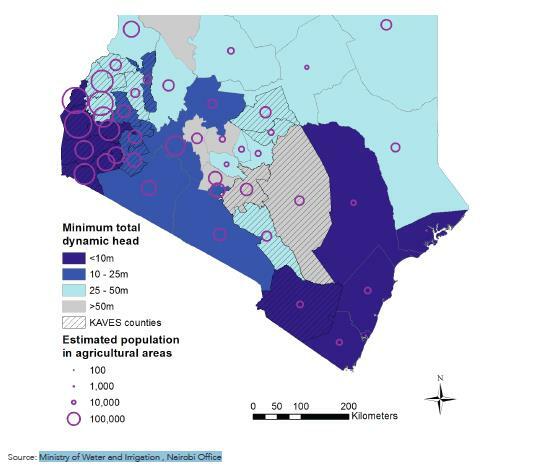 The map below, produced by Winrock International using data from the Ministry of Water and Irrigation Nairobi Office, shows the lower range of Total Dynamic Head (a measure of the power needed to pump water) and the estimated population of farmers in each county in Kenya. As the map shows, in order to serve a majority of the population, we needed to design a product that lifts water far beyond 10 meters. Lesson 3 – If it breaks, so will our financing platform. It’s no secret that unlocking end-user financing is key to new product uptake. Initial results from our Pay-As-You-Grow trial are promising. High repayment rates indicate that customers are satisfied with the value of the service and many customers have asked for additional products such as drip irrigation. This refinancing is key to SunCulture’s strategy of moving farmers up the agricultural productivity ladder by offering loans for additional farm assets like drip irrigation as customers build a positive repayment history. Internet of Things (IoT) technology plays an important role in facilitating PAYG. GSM connectivity enables remote deactivation should a customer default on repayments and remotely monitoring system performance reduces after-sales costs as common issues like incorrectly oriented solar panels or loose connections can be resolved by phone without the need to dispatch an agent to the site. However, the number one reason customers are not current is an after-sales issue. If the pump breaks, customers don’t pay and it is expensive and time consuming to understand the issue and get the customer back on track with payments. So, in partnership with Microsoft, we’re also developing machine-learning enabled predictive maintenance services that take advantage of RainMaker’s remote monitoring functionality. Providing affordable maintenance services in rural Africa is a challenge due to long travel times and associated costs, but predicative maintenance technology provides an opportunity to streamline costs, build brand value with excellent customer service and reduce performance-related PAYG customer defaults. Lesson 4 – Battery pack improves reliability. RainMaker features a portable battery pack paired with an internet-connected controller, which enables the system to operate for up to 4 hours under cloudy conditions. Kenya receives an average of 121 annual days of rainfall, concentrated around two rainy seasons. The heaviest rain falls during a season known as the ‘long rains’, in late-April, May and early June. During the second rainy season, the ‘short rains’ occur during a few weeks in November and December. The relatively cool season, from late-June to October, gets much less rain, but receives heavy cloud cover with an average of 125-175 monthly hours of sunshine (compared to December-March, which receive 250-300 hours of sunshine. Kenya has high insolation rates, with an average of 5-7 peak sunshine hours and average daily insolation of 4-6 kWh/m2. Peak output from a 120W solar module during noon-time clear sky periods is 120W, however during cloudy periods panel output drops to 10-20% rated output. While Maximum Power Point Tracking (MPPT) controllers like the one included with RainMaker increase panel output by 10-30% by adjusting voltage to track maximum power point, inductive loads (such as solar water pumps) require a solar array to be oversized by more than 1000% to accommodate the initial startup surge requirement of the motor during cloudy periods. Providing a battery pack removes the need for such oversizing and enables the system to operate reliably during cloudy weather, particularly for domestic water needs. Battery packs present significant cost advantages as well. When compared to pumped storage, battery packs are significantly lower cost, more portable and easier to install. A 5,000L water tank with stand and installation costs approximately US $500 compared to a US $50 deep cycle lead acid battery which stores sufficient energy to operate the pump for 4 hours under cloudy conditions. Seventy percent of the world’s uncultivated arable land is in Africa. And yet, an African country like Kenya with 5.8 million hectares of arable land, imports three million bags of maize worth $145.5 million per year largely due to an over-reliance on rainfed agriculture, which limits yields and exposes smallholder farmers to increasingly unreliable rainfall. Under irrigation, maize yields exceed 30 bags per acre compared to the national Kenyan average of just 18 bags. Increasing maize cultivation under irrigation by 250,000 acres, less than 2% of Kenya’s arable land, would make Kenya a food secure nation. Based on our early findings, we believe that increased adoption of affordable smallholder-focused irrigation solutions can make this possible. SunCulture aims to contribute towards this by further innovating products and services like Rainmaker, and importantly PAYG financing solutions to reach lower-income groups. Focusing on performance and affordable energy storage will drive repayment and bring down maintenance costs. We believe we can demonstrate the impact of such solutions with farmers in several countries, and hopefully kickstart the adoption of low-cost irrigation solutions by smallholder farmers around the world.